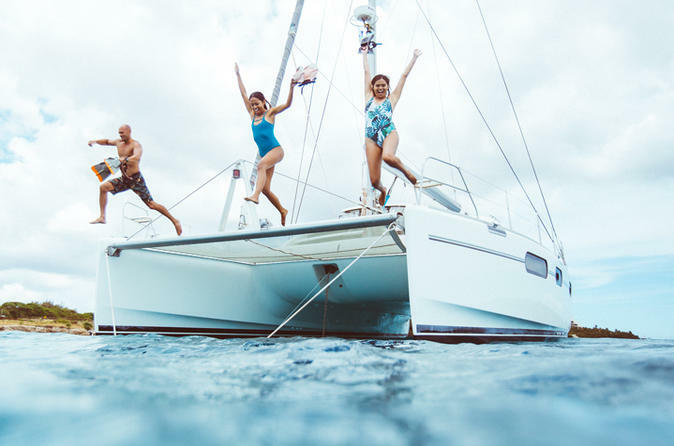 Get with Oahu's ultimate charter on a 46-foot world renown yacht in a private tour while enjoying the waters of West Oahu on this 4 hour experience. Aboard there’s more than enough space to lounge and relax in this intimate setting. Sip on drinks from a bottomless bar as you take in the vast views of the island and our Hawaiian ocean, also you can satisfy your midday appetite with a fresh personal lunch prepared aboard. Use provided professional snorkel equipment to get up close and personal to our many fish, mammals, and crustaceans during your guided snorkel. Start your morning by meeting the Captain of your private charter at Ko Olina Marina. After being greeted and boarding the vessel, get comfy as the yacht departs to the horizon. Enjoy the space of three bedrooms, three restrooms, a full kitchen, lounging areas, and even bean bags! Settle in and enjoy the breeze through your hair sipping on a drink from the hosted bar that includes soft drinks, beer, white wine, sparkling wines, and spirits. As you sail up the West Oahu Coast keep an eye on the water as marine life teems through the ocean. From the boat, you may see Hawaiian Spinner Dolphin, Humpback Whales (Seasonally), Pilot Whales, Bottlenose Dolphin, Turtles and even Flying Fish. Upon arrival and anchoring at the snorkel area, get ready for some fun in the water. The professional snorkelling gear and instruction will get you under the sea to view an array of tropical fish, Hawaiian Green Sea Turtles, eels and much more! Have fun jumping off the boat, dipping your feet off the swim step or relaxing on the inner tubes. After a bit of adventure, return to the yacht for a fully prepared personal lunch. Dine on your personal meal that includes pasta salads, fruits, cheeses, Hawaiian chips, an entrée, and a warm cookie! Finally, bask in the sun as we slowly make way to return to the marina. A true charter experience – inclusive of signature service and endless aloha.